Looking for a solution to a issue with Di2 setup. 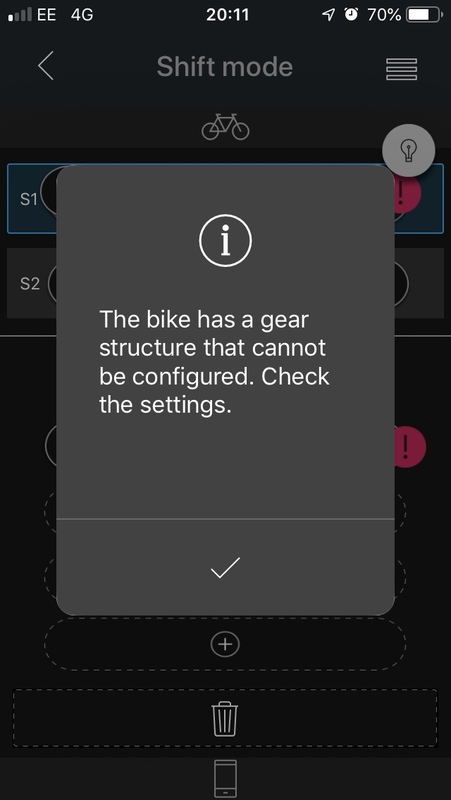 I be tried setting up the chainrings & cassette on the app but I keep getting an error message regarding the gear stricture. E-Tube has goofy lockouts on how many multi-shifts etc based on gearing. Which would be my first suspect as to why it is erroring out. WHat happens if you select 50/34 or 53/39 for your crankset? Last I looked D/A didn't support 46/36...but that was a while ago. Jus lie to E-TUBE and tell it you have a standard double with a standard 11-28 cassette and then you should be able to be semi and full synchro going. You won’t be able to configure the full shift points but you can’t really do this even with standard gearing. Di2 only allows you to set the system to use whatever components Shimano currenly sells. Thus something like a 30/46 can’t be used in the software. Note that even when selecting current Shimano components, it’ll lock out the 2 smallest cogs while in the small ring, unless you tell it 39/53 or some other crank. If you select a 34/50 it won’t shift to the 11 + 12. In real world, you can lie, and tell the software you are using a 11-28 and 39/53, bit then just install whatever you want. The setup software doesn’t know you are using a 36/46. It only matters if you BlueTooth connect the shifting system to a compatabile dipslay such as Garmin or Wahoo. Then the readout of which cog/ring you are in will be incorrect. on Di2 9150/8050 series, if you have a 36/52 or smaller crankset and you shift into the small chainring up front, then the rear derailleur will not be able to take up the chain slack if you shift into the 2 smallest cogs in the back. That's why Di2 prevents you from shifting into the 2 smallest cogs if your small chainring is 36t or less. A 39t chainring will not be an issue. So yes while you can fool Etube into allowing you to shift into the 2 smallest cogs while on a <36t chainring, it does you no good to do so. What I meant to type. Does anyone know if you can edit the settings file from e-tube? Last edited by ultimobici; 11-12-2018 at 12:02 PM. Sorry, what I meant was editing a file downloaded from E-Tube. But etube doesn't allow you to edit the downloaded profile though. But you really don't need to edit any downloaded profile though. You just need to edit the current "Shift Mode" to something you wish and etube will transfer the new settings to the bike. I understand you're wanting to set Di2 to use the 36/46 crankset and it's not allowing you, right? Then just use something like 36/52 and 11-30 cassette. It'll be fine. You will not gain or lose any Di2 functionality, none whatsoever. Thanks. I feared as much. Functionally it is fine. However, the display on my Garmin drives me up the wall! I know this thread is a couple months old, but I just discovered quite accidentally that you can edit what the Garmin head unit displays despite what is set in the e-tube app. Just go into the sensor details of the Di2 sensor, tap Front Gears (or Rear Gears if you want) disable the Automatic setting, and you can put in whatever numbers you want. Now your Gear Ratio and Gear Combo numbers will be accurate. This will not affect the Synchro Shift though. Does it actually stick past a ride/reboot, now? When I was on Garmin I found editing the gears settings wouldn't stick past a reboot. Yep, just tried it. Just make sure to disable the automatic setting. When I discovered this a year or so ago, the next connection via BT would have the Di2 system override the Garmin. I'll give it a try again.